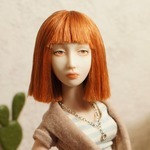 The elbow joints on my new doll aren't sueded and they sound a little scratchy. Is there a particular type of clay we are supposed to use to suede with clay? I think they are too thin for leather sueding, but the scratching porcelain concerns me. I was going to use LaDoll white airdry clay. Is this ok to use? I think people use a polymer clay. I haven't tried it myself. If you look through the old workshop threads you will find a tutorial I made for re-sueding a doll with leather. Also, I wanted to thank you for the great review you left! Thanks so much And you're welcome! I dont see why you cant use paper clay, then you would just need to let her dry. I have also see people use caulk- like silicone caulk. The nice thing about the paperclay, is that you could easily remove when you want to, also it is the right color. Thanks! I ended up using the air dry clay and it worked perfectly.